I recently finished a basement, which included a bathroom. I needed to remove a section of concrete for the plumbing. It was a messy and hard job for a homeowner, but I found I was able to complete the job in a day. To have hired a contractor to do this I would have spent $1,000. I first had the plumber come in and mark where he wanted the floor removed. I then rented a saw built for cutting cement from a local hardware store. Prior to the actual cutting, I prepared the surrounding area by tacking up plastic walls. Note that it is critical when doing this job that you ensure good ventilation, because it will get extremely dirty and dusty. Also have eye and ear protection as it becomes difficult to see and the saw is extremely loud. I did not run water over the area prior to cutting, as the saw did not require it, however you may want to consider using some. As a result of not using it, I had dust everywhere: Basement, 1st floor, and 2nd floor. Once you have cut the sections, use a sledge hammer to break up the concrete and remove it. In my case, I had to install a 32 gallon pump up container. The size of a trash can. 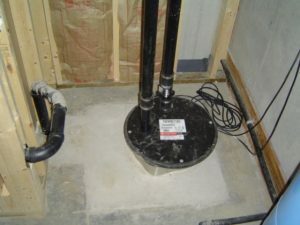 You will need to dig down at least 28″ such that the top of the pump up system is only a few inches above the finish floor grade. It is preferable to get it down to grade level.